Originally known as Sir Gabriel Wood’s Mariners’ Asylum, the home was opened on October 17th 1854, having been founded as a result of a bequest by commissary general Sir Gabriel Wood (1767-1854). The son of a Greenock merchant, Gabriel Wood was born in Gourock on May 19th 1767. During his civil service days he served in the capacity of Vice-Consul for the state of Maryland and later Commissary-General of Accounts for the Caribbean, the Mediterranean and then of Canada - the most important army position abroad. He died at Bath on October 29, 1845 aged 78 having bequeathed funds that would allow a Mariners' Home to be set up for the reception of fifty, aged and decayed Merchant Master Mariners and Merchant Seamen, natives of Renfrew, Dumbarton, Argyle & Bute and Ayr all of whom should have attained the age of 55 years and be of good character. In his will the residue of his estate after certain provisions for legacies passed to his widow Lady Louisa Augusta Wood and his sister Miss Francis Ann Wood. A memorandum was discovered setting out Sir Gabriels wishes for Lady Wood and his sister to erect the ‘Asylum’. Though not legally bound to carry this out both ladies loyally continued the care and concern so obviously expressed by Sir Gabriel and signed a Declaration of Trust by which the sum of £38,000 was handed over to the named trustees. The architect of the Home was Robert MacIntosh of Exeter, a friend of Lady Wood who along with Miss Francis Ann Wood chose the superb seven acre site, then on the outskirts of the town. On Thursday October 17th 1850, the same day as the laying of the copestone at Greenock’s Victoria Harbour, the foundation stone of Sir Gabriel Wood’s Mariners’ Asylum was laid with full Masonic honours by Sir Michael Robert Stewart Baronet of Greenock and Blackhall. The building cost £8,500. The Home as it is now called is held in trust by The Sailors’ Society and is administered by a local volunteer committee. 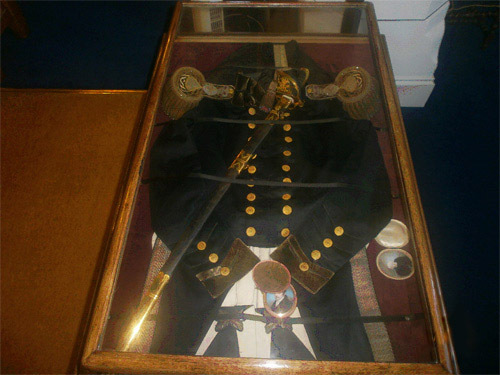 Sir Gabriel Wood's uniform above as it stands today in our church.